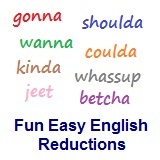 ﻿ Fun Easy English - new-american-english-reductions-reduced-words-topic-word-you-want-you-wancha. In this lesson you will learn the American English reduction wancha. I wancha to leave me alone. Does she wancha to go to the party? Does he wancha to pay for half of the cost? I wancha to come with me now. They wancha to pay with a credit card. This is another reduction in English typically used by young people. Reductions, such as wancha are not real words in English.